Colonel Charles Guy Powles along with Officers of the Canterbury Mounted Rifles produced in 1928 a collective work called The history of the Canterbury Mounted Rifles 1914-1919, in which included a section specifically related to the battle of Beersheba and is extracted below. The 2nd Light Horse Brigade then took the road down to the plains cast of Beersheba through Bir Arara, and the remainder of the Division, with the Wellington Regiment as advanced guard, followed the track over G. eI Shegeib. Some opposition wan met with, but was brushed aside by the Wellingtons, and by 8 o'clock in the morning of October 31st the Division had reached the line Bir el Hamman (2nd Light Horse Brigade), Bir Salim Irgeig (N.Z.M.R. ), with the 1st Light Horse Brigade in reserve behind the New Zealanders. The force was now within striking distance of the Beersheba defences, and the N.Z.M.R. began to attack Tel el Saba, the key to the Beersheba defences on the east side. The Auckland Regiment advanced upon the hill, the Canterbury Regiment moving up on its right flank with the intention of enveloping the tel from the north. The plain is much broken by the winding wadi beds with steep banks. But though these obstacles slowed down the attack, they provided covered lines of approach, and the  Aucklanders, backed up by the Somerset Battery, worked their way mounted to about eight hundred yards from the enemy main position, where excellent cover for horses was found. Goood covering fire was also afforded, and the Canterburys slowly gained ground, against much machine gund and artillery fire, the latter coming from the high hills to the north. 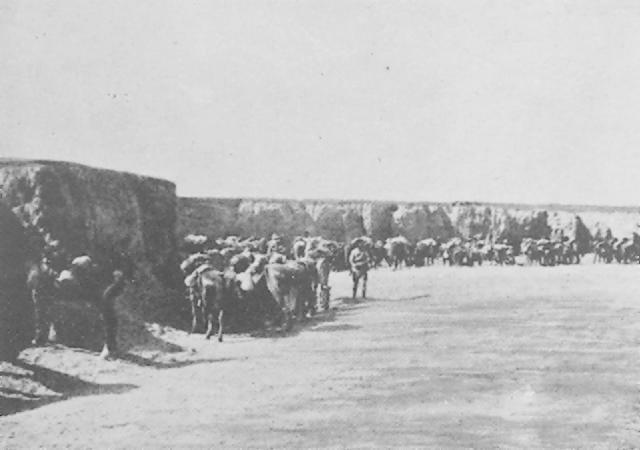 The 3rd Light Horse Regiment of the 1st Light Horse Brigade was now sent forward to support the Aucklanders' left, with whom were now the Wellington Mounted Rifles and the Canterburys made ground to the right until, passing over the Wadi Khalil, the Regiment brought fire to bear on the rear of the Tel, but owning to heavy fire from the large Turkish forces in the hills to the north, could go no farther. At 3 o'clock the Auckland Regiment rushed the hill, and soon afterwards the whole Brigade concentrated in the Wadi under shelter of the Tel to escape the heavy Turkish artillery fire. By dark the town of Beersheba was in our hands.